At a community engagement forum on July 6, 2018 in Toronto, Ontario, Canada, Slate Asset Management introduced architecture firm Studio Gang’s design for the redevelopment of a downtown block—with a new mixed-used tower—at the southwest corner of Yonge and Delisle. It’s designed to add revitalizing residential density to a tired area of an otherwise vibrant downtown. 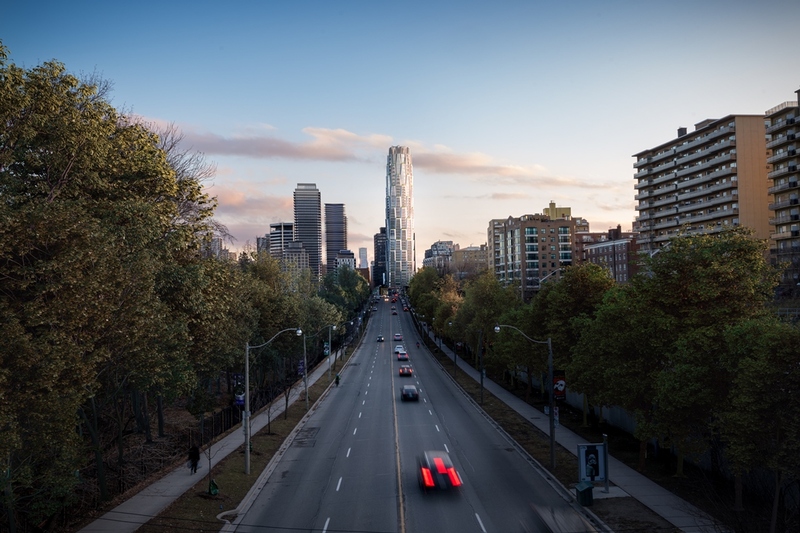 Jeanne Gang, Founding Principal of Studio Gang, presented the vision for the project—called One Delisle—to local stakeholders, including members of the Deer Park Residents Group, Yonge & St. Clair BIA and the broader community. The block as it looks today. There are three existing buildings on the site of this transformation: a two story commercial building at 1496-1502 Yonge Street; a pair of three-story commercial buildings at 1504-1506 Yonge Street; and a two-story commercial building at 1508-1510 Yonge Street. None of them are deemed heritage structures, but Slate is preserving the façade of 1496-1502 Yonge Street, which has historic elements. 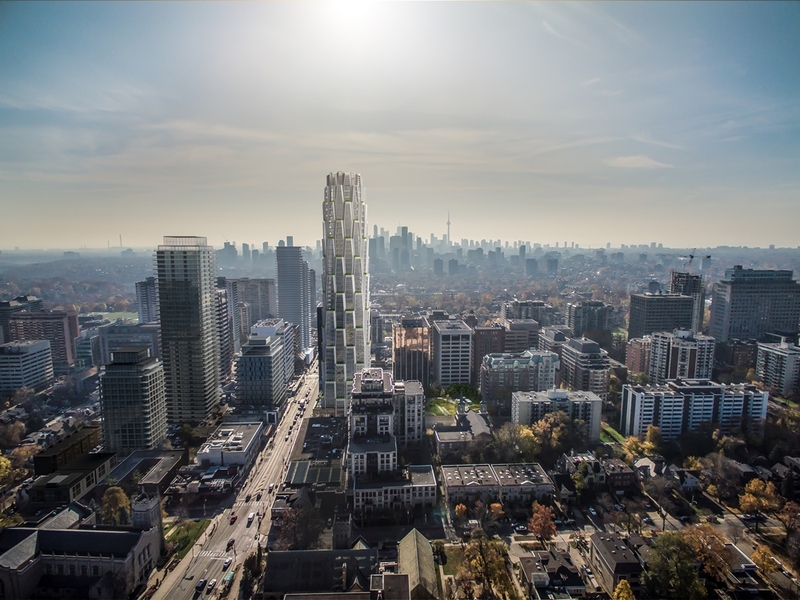 Designed by Studio Gang in collaboration with local firm WZMH Architects serving as architects of record, the tower is conceived as a new model for sustainable urban growth. 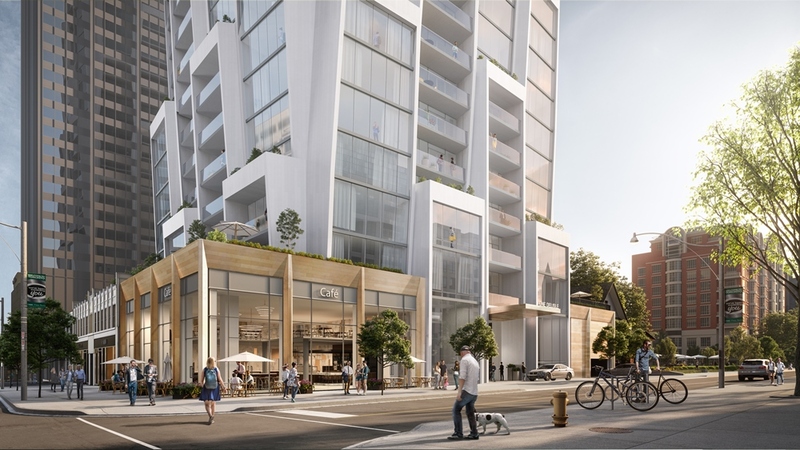 One Delisle will bring broad-based urban improvements to the Yonge and St. Clair community through the infusion of new residential and retail uses. Located at an important transit node in midtown Toronto, the project aligns with Slate’s long-term vision to re-establish Yonge and St. Clair as a vibrant, pedestrian-friendly neighbourhood with thriving retail, welcoming open spaces and world-class architecture. “The proposed building at One Delisle is only one component of this project. Because of our holdings in the area, we’re in a unique position to take a holistic city building approach,” says Brandon Donnelly, Vice President of Development at Slate Asset Management. Slate has been acquiring property in the midtown neighborhood since 2013 and currently holds ten properties, including all four corners at the intersection of Yonge Street and St. Clair Avenue. Rooted in the existing architecture of the neighbourhood, One Delisle aligns with the city grid at its base, as well as with storefronts along Yonge Street. 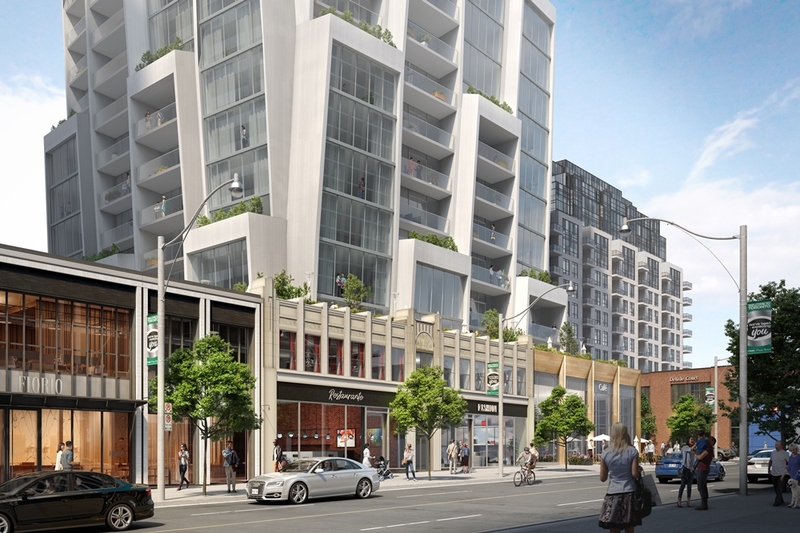 The proposed design also retains elements of 1498 Yonge Street, preserving the community’s main street character. The generous setbacks on both Yonge Street and Delisle Avenue allow for wider sidewalks, increased sunlight at street level, and new fine-grained retail—all of which will create a more enjoyable pedestrian experience. Moving upward from its rectilinear base, the building gently transforms into a compact, sixteen-sided tower that dramatically reduces shadows on the surrounding streets and neighbourhood. 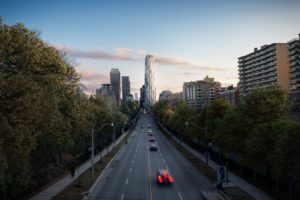 This transition also responds to the site’s grade change and the bend along Yonge Street, which makes the location of One Delisle a view terminus and an ideal gateway to the Yonge and St. Clair community from the north and from other neighbourhoods in the city. The tower is designed as a series of eight-storey elements, which nest together as they spiral up the façade. The angled, alternating geometry allows for variously sized floor plates that result in unique conditions within the units, bringing a diversity of residential options to the mixed-use neighbourhood. Tuned to Toronto’s climate, generous planted terraces atop these elements and protected balconies within them extend outdoor living into the shoulder seasons. One Delisle is designed to transform the drab block into an expansive, pedestrian-friendly neighborhood. Based in Chicago, New York City, and San Francisco, Studio Gang is widely recognized for architecture that elevates the urban environment while cultivating beneficial connections among people and with their natural and urban environments. This ethos is visible throughout Studio Gang’s diverse portfolio, which includes Aqua Tower in Chicago, Folsom Bay Tower in San Francisco, and 40 Tenth Avenue along the High Line in New York—each of which emphasizes connections among people, the city and nature. 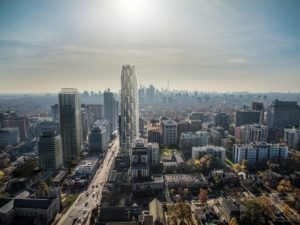 One Delisle will be Studio Gang’s first tower in Canada and Slate’s first ground-up development in the area, signalling a unique collaboration that combines global experience and high design with a significant, long-term investment in the Yonge and St. Clair neighborhood. As part of ongoing efforts at Yonge and St. Clair, Slate has sought out opportunities to improve the public realm in a variety of ways, from commissioning an eight-storey mural by a British street artist in 2016 to introducing the new Gensler-designed ravine bench along Yonge Street last summer. One Delisle presents an opportunity to continue this legacy: in parallel with the project, Slate is revitalizing and expanding the Delisle-St. Clair Parkette, in collaboration with Janet Rosenberg Studio, through the incorporation of existing surface parking in the area. All images by Norm Li, courtesy of Studio Gang.